Using Hourly Boards (a.k.a. 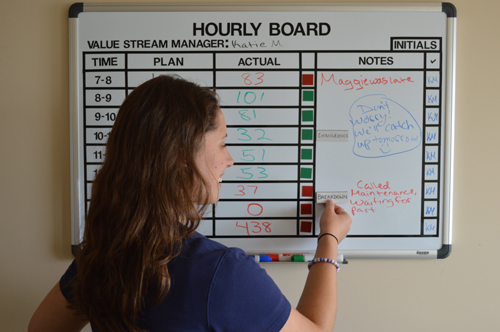 60-Minute Boards or Production Boards) are a great way to keep your team informed on whether production is on-target, ahead or behind. Waiting until the end of the shift to find out if you met the planned production for the day is a little too late to do anything about it. Real-time information would be best, but sometimes that is costly to setup or takes a lot of effort to perform. Takt-time awareness is great for an operator so she knows if she is on pace. A different level of responsiveness is needed for management, if you were a supervisor you probably wouldn’t want to hear every minute that “We’re on-time.” A pitch increment or pack-out quantity may be better, but that too may not fit every situation especially outside of manufacturing. The type of display board we suggest is perfect for manufacturing production areas, office and support functions, and even healthcare. Use them anywhere you want to see if you are on target or not. If end-of-shift or real-time aren’t the appropriate solution to communicate production levels, what is? The answer is Hourly Boards. Using a mechanism where on a consistent basis the actual units produced is compared to the planned amount is recorded; any countermeasures for errors can be incorporated closer to real-time. Having your team involved with creating the board is the first step. Ask them what they would like to see on the board. By including your team members not only do you get better ideas by having more input, you build buy-in with your team members because they were part of the solution. You can also discuss the reason or need for the boards – which it will help with understanding abnormal situations. Tell them the “why” before you work on the “How”. Start the day with a short start-up meeting. Mention any open issues from the day before, any changes to the upcoming schedule, changeovers, maintenance items, 5S, and any: quality, cost, delivery, and safety items. During the shift, communicate any issues that come up – especially any reasons that the target conditions weren’t met. Assign the appropriate person (hopefully someone closest to the process) to help investigate the root cause and coach them to propose a countermeasure. Have a quick end-of-shift meeting at the board to review the day’s work. Talk about what went well, what didn’t, opportunities for improvement, upcoming schedules, and so on. One of the advantages of using a manual display board (versus electronic – hey, don’t worry I like those too) is that a person has to take responsibility to write the actual hourly production number on the board. This is a tactile process – the person has to grab a dry-erase marker, uncap it and write the actual hourly production number on the board, now they own that number. To visually enhance this experience a green marker should be used when the production number is met or exceeded (along with a congratulatory note would be nice). A red marker should be used whenever the target or planned number is not achieved along with an explanation why and a proposed countermeasure. The target units and can be written in black and notes for the team can be in blue. These visual indicators will make it simple and easy for the people on the team to get a grasp of the situation quickly and without any guessing. Hourly Production Board from 5S Supply on Vimeo.